THIS IS PASTOR'S CALL FROM THE LORD! Ezekiel 3:17-21 (KJV) 17Son of man, I have made thee a watchman unto the house of Israel: therefore hear the word at my mouth, and give them warning from me. 18When I say unto the wicked, Thou shalt surely die; and thou givest him not warning, nor speakest to warn the wicked from his wicked way, to save his life; the same wicked man shall die in his iniquity; but his blood will I require at thine hand. 19Yet if thou warn the wicked, and he turn not from his wickedness, nor from his wicked way, he shall die in his iniquity; but thou hast delivered thy soul. 20Again, When a righteous man doth turn from his righteousness, and commit iniquity, and I lay a stumblingblock before him, he shall die: because thou hast not given him warning, he shall die in his sin, and his righteousness which he hath done shall not be remembered; but his blood will I require at thine hand. 21Nevertheless if thou warn the righteous man, that the righteous sin not, and he doth not sin, he shall surely live, because he is warned; also thou hast delivered thy soul. There are many days during my intimate times with the Lord that He will open the scriptures to my heart. He has lead me to share them here for all that wish to read and gain a deeper understanding into the Word of God. May the Lord touch you as He has me. Pastor A. J. For some time I have felt, for lack of a better word, a drifting off center of many of our partners. It seems that with the flowery teachings I hear from many of you, but with the harsh teachings the airwaves grow very silent. To be honest I check all the e-mail addresses on our inner circle of pastors list regularly and they are good but I only hear from a few. You may not realize it but you are each important to myself and this ministry and are all in my daily prayers and thoughts. I just think it is time for all of us, this includes myself to re-exam our basic beliefs. We are not here to help orphans, we are not here to build churches, we are not here to start Bible schools, we are not here to have pastors conferences, we are not here to continually feed the same church group each Sunday morning. Though each of these has their merits and are good we are here for one thing and one thing only. We are to Mark 16:15-17 (KJV) 15And he said unto them, Go ye into all the world, and preach the gospel to every creature. 16He that believeth and is baptized shall be saved; but he that believeth not shall be damned. So why do I bring this up? A little over a month ago Mary and I were rear ended in our vehicle. I took Mary to the emergency room to have her neck checked out. While there we met a very nice young woman, who was finishing up her Physician Assistant schooling like our daughter and was working in Pinedale on her final rotations. Well because of the common ground both Mary and I struck up a conversation and got to know her as we told her of our daughter's progress. Yet, during that time, whether because of worry for Mary, whether because of being distracted by the events of the day, this old pastor failed to talk to this nice young lady about Jesus. On January 27, she was killed in an avalanche in Jackson Wyoming. You see my friends I may have been the last Christian to have a chance to tell her of Jesus and I failed. Sadly, I know the excuses will be worthless on judgment day, if I missed that last chance to give her Jesus. Why, I did not give her Jesus, I cannot say, But, I only hope and pray it will never happen again. It seems we are so wrapped up in our little lives, spending so much time on feeding, educating, coddling and working with "Christian's", we forget our call and that with every individual we meet we may be the last witness of Jesus before they are called. I keep the newspaper article of her death in my prayer journal to remind me I may be the last witness. Psalm 19:7-10 (KJV) The law of the LORD is perfect, converting the soul: the testimony of the LORD is sure, making wise the simple. The statutes of the LORD are right, rejoicing the heart: the commandment of the LORD is pure, enlightening the eyes. The fear of the LORD is clean, enduring for ever: the judgments of the LORD are true and righteous altogether. More to be desired are they than gold, yea, than much fine gold: sweeter also than honey and the honeycomb. I am going to do a series of teachings on getting back to the basics. Today's is about whether or not we really can believe God's word. As for me and my household we believe it 100%. If we silly Christians would just absorb God's holy and pure word instead of some "great" man of God's ideas or even worse the worlds ideas of what God is saying we would be so much better off. The first verse of today's teaching speaks of how the law of the Lord is perfect converting the soul. The Hebrew word for converting is eL shub shoob. This word means to turn back, or more correctly return to the beginning. So what David is saying is that the purpose of the Law of God is to help us return to the beginning. What beginning? To a time of purity and holiness, to a time of being clean before the Lord. Interesting, God did not institute the Law to make us feel guilty, to burden us with ordinances we could never do, but to show us the error of our ways. You want a great way to witness to a sinner? Just use the 10 commandments. Think about it, it is easy. Let's start on common ground. With the sixth commandment you can ask someone if they have ever killed someone. Of course they will answer NO! but the Bible tells us that if we have ever hated someone in our hearts we have committed murder in our hearts. Bingo! You just showed the sinner in God's eyes he is a murderer. Let's go on, the seventh commandment says you shall not commit adultery. So again you ask the sinner ( especially a man) if he has ever been an adulterer? Again your answer will most likely be a resounding NO! But you gently remind him Jesus said that any man who lusts after a woman in his mind has committed adultery with her. If you're a man witnessing and you are truthful you know that at some point in your life you looked at a woman with more than pure intentions. So, now we have convinced the sinner in God's eyes he is an adulterer. Now we go on to the eighth commandment you shall not steal. Everyone has stolen something. Whether it is an idea, or whether the store gave you a few bits of extra change back and you did not stop them. Whether it was a as a kid on a dare or some friends item you just had to have. No matter how large or small if we are totally honest we all have stolen something. So now God's law has brought this sinner back to the beginning. They now realize that they are lying, thieving, adulterers at heart and have only gone through three commandments. Now they can be brought back to the point that God wants and back to that beginning which is that saving grace of Jesus. "The testimony of the LORD is sure, making wise the simple" The testimony or witness of the Lord will make wise the simple. To put it in the simple Hebrew terms this says that the witness of the Lord is faithful to teach wisdom to the silly or foolish. If we take the Lord at His word and we study the word of God in the Spirit and truth it will give us all the wisdom we will ever need for our lives. The other day I was reading a worldly teaching on investing. The author quoted Solomon and called him the wisest man to ever live. This author used Solomon as an example of how to invest your money. He was not speaking of how to give to God but how a worldly person should save for the future. Interesting Huh? I have been in the ministry for almost 30 years and 99% of the wisdom I have came from the Word of God, the 1% I call me! It did not come from the 22 years of schooling man put me through but the pure and simple word of God. The statutes of the LORD are right, rejoicing the heart. The Hebrew for statutes means a precept. If you look up precept it is defined as a doctrine that is taught or a rule of personal conduct. So, the doctrine or the life rules we Christians live by bring rejoicing to the heart. But, did you notice the word right? The statutes of the LORD are "right"! This is a very interesting Hebrew word here. At first glance we only get that it means straight. We must remember though that the Hebrew language had many different meanings and variations that are hard to put into one English word. If we look deeper at the root it means to be straight or even and to make prosperous. Do you get it? The doctrines of the Lord make us straight, even and prosperous in the heart. Now, let's look at the Hebrew for rejoicing. It means to make bright or brighten up. So this short verse is telling us that the "Doctrines we believe and live by are going to keep us on the straight and even course and make our heart brighten up and be prosperous." Wow! See what a little study can show you? The commandment of the LORD is pure, enlightening the eyes. This again says that the precepts or our beliefs are beloved and clarify. It tells us that they make our eyes luminous. I cannot speak for you, but I honestly cannot count how many times I will be reading the scriptures and I will come across one I have highlighted in the past. However, it will be like I have never seen it before. My eyes will be luminous toward that scripture and its meaning will become clear as the noon day sun on a clear summer day. That scripture will go straight to my heart and many times will provide insight and comfort for a certain situation I am going through. It is as if God has reached out and said to me personally here is what you need to know. The fear of the LORD is clean, enduring forever. I love this, it is so true. The fear or reverence of the Lord is clean. The Hebrew here for clean is pure in the moral sense or if we go to the root is uncontaminated. Do you get the idea in the first part of the verse? You cannot revere the Lord from a contaminated or evil point of view. When you truly fear or revere the Lord it is from a real uncontaminated realization of who God is in the grand scheme of things. You cannot truly revere or fear the Lord for selfish reasons. You can only truly revere the Lord when you come to the pure, uncontaminated realization of who God is and what you are! The great thing is that it says "enduring for ever". Think about it, if you do not endure for ever how will your reverence of the Lord? Again a promise. If we fear and revere the Lord as we should, it and we will endure for ever. This is a very important point. So let's look at a few other scriptures. Proverbs 14:27 (NLT) 27Fear of the LORD is a life-giving fountain; it offers escape from the snares of death. So here the wisest man to ever lives tells us that the fear of the Lord provides two more benefits. First it is a "life-giving" fountain. The Hebrew here means just that! If you Fear the Lord first and foremost you will have a strong healthy life. But the second is even more important. When you look to the Hebrew root for the authors meaning Solomon is telling his reader that the fear of the Lord will keep you out of Hell! Yep! That is what it says! Let's go on Proverbs 19:23 (NLT) 23Fear of the LORD gives life, security, and protection from harm. Ok, We have already got the life part. So look at this one SECURITY! The Hebrew here is telling us we will be set, placed, permanently satisfied or full. Secondly it tells us we will not see or be visited by evil or bad both physically and Spiritually. WOW! What a promise in one little verse! Can you truly realize what the whole Word of God contains? What's next? You ask. Let's see Proverbs 22:4 (NLT) 4True humility and fear of the LORD lead to riches, honor, and long life. We have covered life so lets look at the next. "Lead to Riches" The Hebrew here can be interpreted to mean nothing but wealth or to become rich. Now God's idea of rich and ours is mostly likely different. But, I will tell you the truth, Mary and I have had our financial ups and downs. Yet, we have never gone without. Yes, I mean without anything. We are rich my many standards around the world. We are not rich by the standards of America. But, in our years working for the Lord and fearing only Him we have never gone without a roof over our heads, a vehicle to drive, food in our bellies, clothes on our backs or work to do for the Lord. The final thing in this promise is honor. This means honor from both man and God. One man who used to serve on the Board of His Will Ministry once got mad at me for "sowing descent in the church!" We were talking on how we need to be followers of Jesus first and not followers of religions. He was a member of a local church and followed every word of doctrine they preached. I think he would have jumped off a cliff if they told him to. To my point, two days after resigning from the board because I was a sower of descent in the body of Christ he sent Mary and I a card saying what great people of God we were and how we loved the Lord and only wanted to serve Jesus. You see, if you fear the Lord God almighty first and foremost man will honor you whether or not they want to. The judgments of the LORD are true and righteous altogether. This one is simple and you can either accept it or not. David is telling us that all the judgments, verdicts, sentences, justice, and punishments of the Lord are true, or trustworthy and righteous or right and fair, altogether or totally. 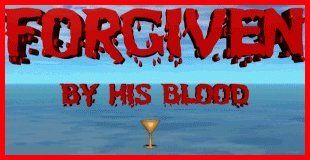 David is saying whether we like it or not all the judgments of God are totally deserved and just. As a Christian you either believe this or not. It really does not matter if you understand WHY? God does not have to explain Himself to you or I. Our Lord is the creator of the Universe and whether I understand all He does is not important. What is important is that I follow His word to the death. Are you willing to believe and follow the Word of God until you breathe your last breath? The tide of evil is covering this world more and more and there is only one thing we can be sure of and trust. That is our Lord and Savior and His Father in heaven. Proverbs 30:5-6 (NLT) 5Every word of God proves true. He defends all who come to him for protection. 6Do not add to his words, or he may rebuke you, and you will be found a liar. Do you get it every, every, every word! Hebrews 4:12 (NASB) 12For the word of God is living and active and sharper than any two-edged sword, and piercing as far as the division of soul and spirit, of both joints and marrow, and able to judge the thoughts and intentions of the heart. Don't play the word game and only believe part of God's word for you will find yourself on the loosing side. Finally I will leave you with these words of God! The finally part of today's verse. More to be desired are they than gold, yea, than much fine gold: sweeter also than honey and the honeycomb. All of man's greatest wants and desires, riches (gold) and sweets (honey) and they are not to be desired over the pure and holy word of God. Spend sometime there this week and I am sure you will be blessed more than any riches or filling of your stomach. Hidden but easily found! A mid week thought! I am not much of a television watcher, though I do like the old shows from the 50's 60's and 70's. I do like to watch the news, but most of it is so biased that I am not sure how long I will continue that. But I have noticed a new "reality" show titled "hunted" being advertized. The premise is that experts try to hunt down a group of people using all the high tech garbage they can find. From the commercials it is rather ridiculous as the hunters get all the high tech junk and the hunted are on their own! So not really "reality" if one has to be truthful. After many years of survival training I have learned one thing, the two quickest ways to get the advantage in such a situation is 1) turn the hunter into the hunted and 2) remain hidden at all costs and that brings me to the real reason for hiding things. We humans are funny to the reasons we hid things, sometimes we hid things to keep them from being stolen, sometimes we hid things to keep them from being eaten etc. But David gives us the best reason for hiding one special thing: Psalm 119:11-16 (NKJV) "Your word I have hidden in my heart, That I might not sin against You. Blessed are You, O Lord! Teach me Your statutes. With my lips I have declared All the judgments of Your mouth. I have rejoiced in the way of Your testimonies, As much as in all riches. I will meditate on Your precepts, And contemplate Your ways. I will delight myself in Your statutes; I will not forget Your word." yep, God's word hidden in our hearts. Years ago Mary was having a discussion with an atheist and he wanted to destroy all the Bibles in the world. She quickly informed him that even if he managed to destroy all the Bibles, he would have to destroy most of the books found in the Library as they contained enough quotes from God's word to reconstruct the Bible! She then informed him he would have to destroy all the computers and phones in the world that had Bible programs on them! She went on to say finally that he would then have to kill all the Christians in the world because as it is written we have hidden God's word in our hearts! Needless to say he gave up on that idea very quickly! But, even God warned us through the prophet Amos: Amos 8:11-12 (NASB) "Behold, days are coming," declares the Lord GOD, "When I will send a famine on the land, Not a famine for bread or a thirst for water, But rather for hearing the words of the LORD. "People will stagger from sea to sea And from the north even to the east; They will go to and fro to seek the word of the LORD, But they will not find it." When I look at all the false prophets, teachers and preachers in the world today I often wonder if we have not reached this point. But if we have not we are not far from it, so my advice to all Christians is to do just as David did (a man after God's own heart 1 Sam 13:14) "Your word I have hidden in my heart, That I might not sin against You!" I guess that is why I just love to sit down and read God's word like it is the latest great novel. As a youth I was into the old detective novels, I would love to just sit and consume. Now I am into God's novels, the lives and times of all those who followed and served him. I would love to be like Jack Van Impe who has over 14,000 verses memorized and hidden in his heart. But, I am not that good, but I am working my way there. David was right though the more of God's word we have hidden in our hearts the easier it is to avoid sinning against God. A few years ago the rage was W.W.J.D. or what would Jesus Do! Movies were made about it, books were written about it, but I often wondered how many could ask that question when they did not have the answer hidden in their hearts. I mean do you carry a pocket reference so each situation in your life, you take it out and look up what Jesus would do there? Can you see the importance of hiding God's word in your heart, you have that instant reference to know what would Jesus Do! Remember there will come a day when all will be revealed and weighed in the balances of time. 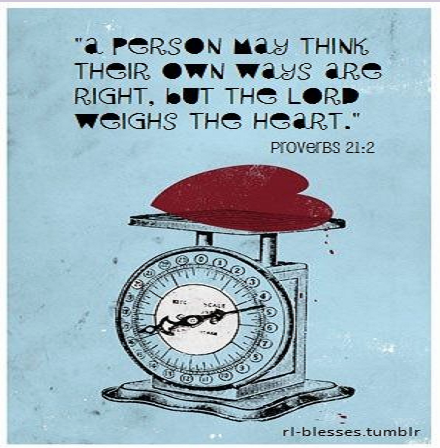 Will your heart be filled with the correct things? Just something to ponder. Pastor A.J.